With just four weeks to go in the 2018 regular season, running backs Ezekiel Elliott and Todd Gurley are in a tight race for this year's rushing title. Gurley moved ahead of Zeke by just 25 yards on Sunday, which is almost nothing with still a quarter of the season to play out. Elliott has 1150 yards so far this year on 240 carries. Gurley has rushed for 1175 yards on 233 carries. They are both about 200 yards ahead of the number-three rusher, the Giants' Saquon Barkley, which makes this a two-horse race. The Dallas Cowboys have a home game against the Philadelphia Eagles this Sunday. They then travel to Indianapolis, come back home for the Buccaneers, and finish the season in New York against the Giants. Based on the current defensive rankings, the Cowboys are set to face the 10th, 12th, 21st, and 24th best run defenses in that order. Those four teams average 113.4 rushing yards allowed per game. For the Los Angeles Rams, they have a tough one this in Chicago against the league's second-best run defense. Then they face the 10th-ranked Eagles at home. They finish up with their division basement dwellers, Arizona and San Francisco, who are currently tanked 29th and 15th against the run. The Ram's opponents average 109.7 rushing yards allowed, just 3.7 less than the Cowboys'. There is a lot of context beyond these statistics, though. As we get late into the year, teams start making business decisions about their roster. With both the Cowboys and Rams in contention for the playoffs, how much wear and tear do they want to put on their top offensive weapons? Rams RB Todd Gurley and Cowboys RB Ezekiel Elliott swap jerseys. The Rams have already shown their willingness to pull Todd Gurley off the field. In blowout wins over the 49ers and Cardinals earlier this year, backup Malcolm Brown had more rushing yards than Gurley as they split carries. Brown is now out for the year with an injury, but Los Angeles clearly won't mind giving carries to another backup if they can keep Gurley fresh for the playoffs. Dallas hasn't been as quick to let Rod Smith run the ball, but they also haven't been in too many blowouts. If later games against the Bucs and Giants aren't competitive, we may very well see the Cowboys give Ezekiel Elliott some rest. However, winning the rushing title is something that running backs love to put on their resume. We can expect both Elliott and Gurley to push to play. Teams aren't totally indifferent to these individual achievements. 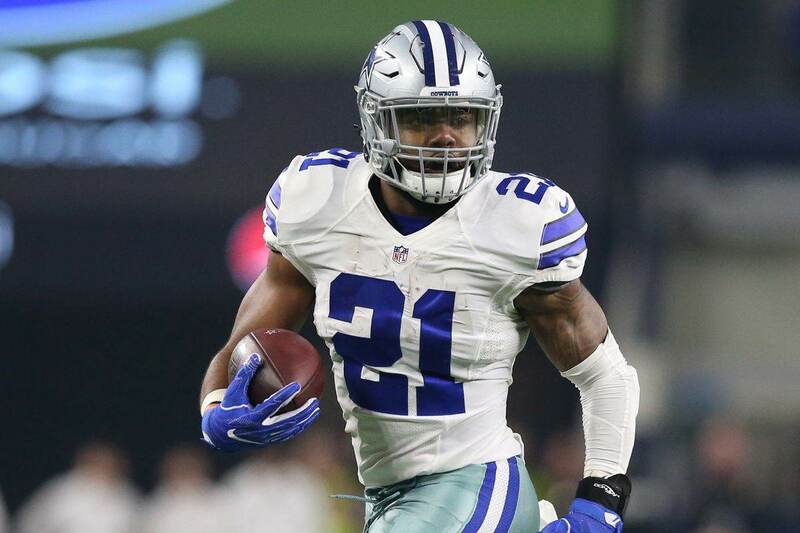 Earlier this year in their blowout win over the Jaguars, Dallas gave Elliott one last carry to start their final drive so he could get over 100 yards rushing for the game. Zeke was pulled immediately after. That said, if either team has nothing to gain in Week 17, we could see them rest starters completely. So, if all things remain even, this should remain an intriguing race to watch. But as postseason contention and player health become of greater concern, could one or both teams get in the way of the fun? Ezekiel Elliott and Todd Gurley will certainly do their part. The two best running backs in the NFL have four more weeks to determine bragging rights.